To be honest, there isn’t anything to do in Krabi Town. It is basically a halfway place to everywhere else. Our bus back to Bangkok didn’t leave until 17:30 so we wanted to see some of the sights around Krabi. 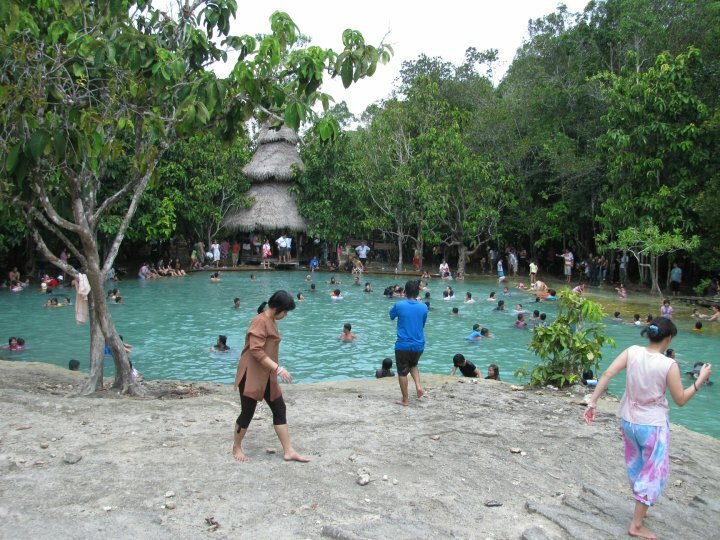 We narrowed it down to just 2 things, the Emerald Pool (Sra Morakot) and the The Hot Springs. 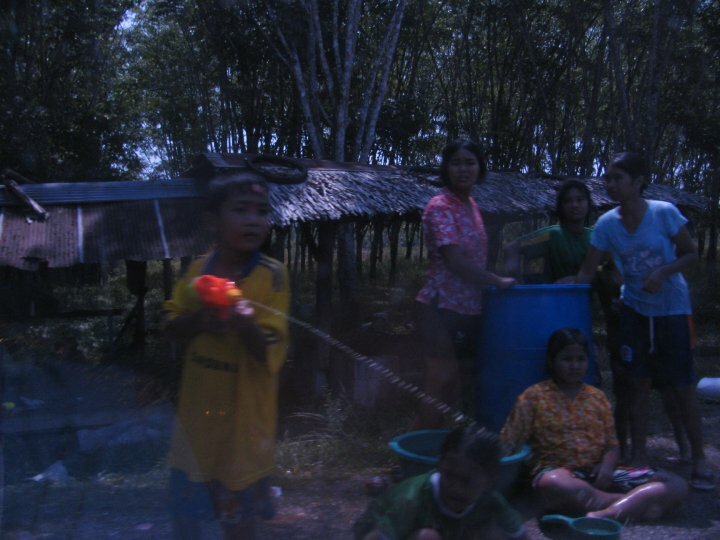 It was the first day of the Songkran Water Festival and there were many kids standing on the side of the road waiting to throw water and colored stuff on people. They seemed to only wet people who wanted to be wet. Our driver didn’t want to be wet, so he kept the windows of his car rolled up. The Emerald Pool, which is in the Khao Phra Bang Khram Nature Reserve, was our first stop. It cost 20THB to get in. It’s usually not as crowded as you see it in this picture, but we happened to go on the first day of a national holiday that was also a water festival. The water is not very deep. If you’re taller than 5’4″ you’ll be fine. Watch out for the occasional rock in the water. Getting in and back out again out can be tricky. Use the wooden walkway if you need to. Should I just jump in like she did? 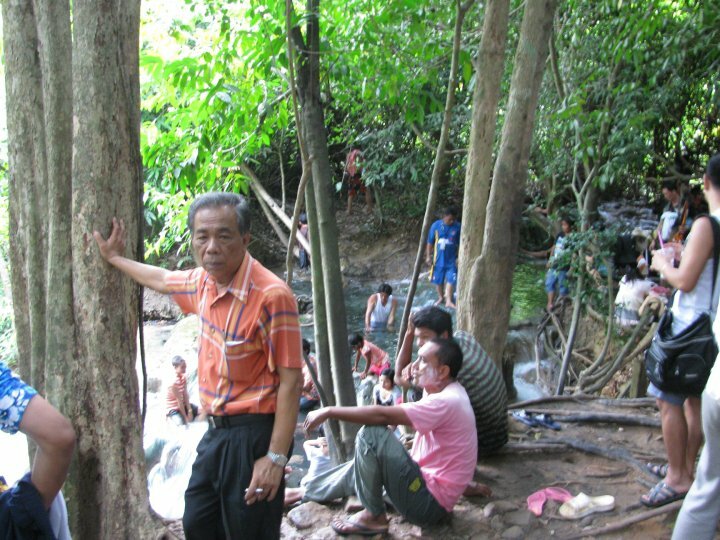 Next we went to Klong Thom to the hot spring. This one cost 100THB to enter. If you go, make sure to go to the top of the mini waterfall. Don’t swim in the river. It’s a death trap! We saw kids jumping in and around in the water. So we thought it was safe to jump in too. Mark and I jumped in. Mark hit his shin on a rock. I slammed my heel on a concrete slab. Once in the water I kept stubbing my toes on sharp rocks. Every turn in this water was potential trip to the hospital. 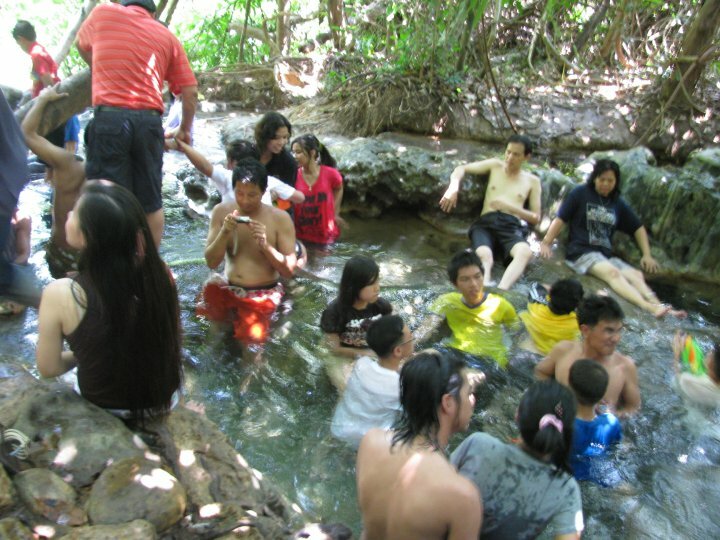 Plus the water was very cold (for Thailand). We got out of the water and walked a little further up the path. There was a natural hot tub with a crowd of people sitting in it. Because the water is hot, people can’t stay in it for too long. We waited for about a minute for some folks to get out and then we took their places. It was great! 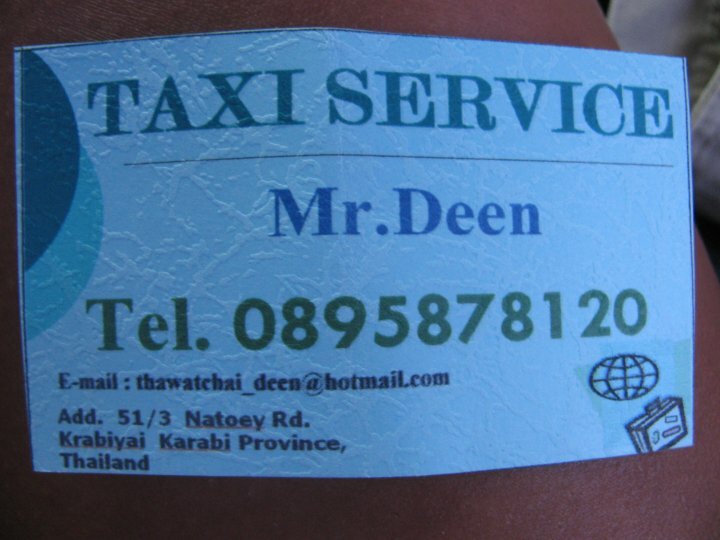 Once we were done soaking up some warmth, Mr. Deen drove us to the Krabi Sea Port. This was where we would get a ride to the bus station and then head on to Bangkok, with a short stop in Suratthani. I was surprised to find free wi-fi at the sea port in Krabi, but there you go. Free wi-fi in the middle of nowhere. We also found a shower in the handicapped bathroom. I’m not sure if it was for anyone to use, but with the choice being between taking a long bus ride while being unwashed or quickly taking a shower and hoping that we don’t get caught, we took the shower. Mark stood watch while I showered. Then I stood watch for him. To our delight, there was hot water. We found this guy through the Good Dream Guesthouse where we stayed. He charged us 1,600THB to drive us around for one day. He was very happy and loved listening to the Eagles and Country & Western music. There isn’t any way to get there by public transportation that I know of. You will have to either take a taxi, rent a scooter, or join a tour group. Take Highway No. 4 to Khlong Thom District and turn left to Route No. 4038 to Lam Hap Sub-district. 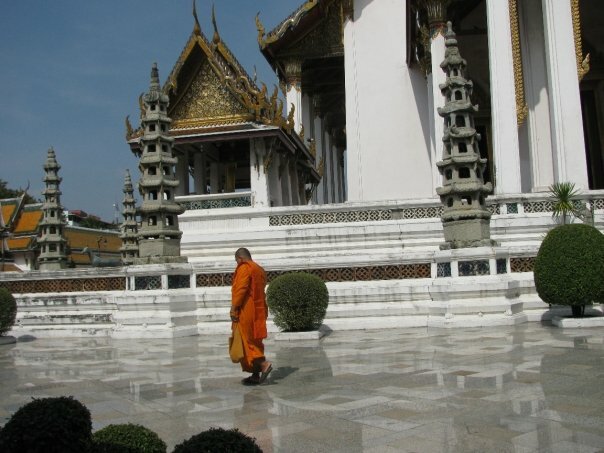 There is an park entrance fee of 20 Baht, but if you are with a tour group this fee would be included in the tour package. I think it closes at 17:00 or 18:00, but I’m not sure. Bring your own towel, swim suit, and sun block. Food and drinks are not allowed in the park, but there are several restaurants at the gate. Be careful. The pool has some rocks and dips in it that you cannot see. If you exit you have to pay to re-enter, unless you are a smooth talker. Go to Ban Bang Khram. Go about 45 kilometres from town to Amphoe Khlong Thom, then take Sukhaphiban 2 Road for 12 kilometers. I think this place closes at 17:00 or 18:00. Be careful when swimming in the river below the hot spring. You might think it looks safe because there are many children jumping in and out and around the river. But these children have very bad parents, who don’t care about their health. There are many sharp, jagged, and poky things that will cut you a leave you needing stitches. Just stay out of the river.